Our three year old classroom is an exciting place for our preschoolers. A place for learning combined with fun. Your child can be somewhat independent and exercise a variety of personal, social and emotional skills. While our 4 year old FOUNDATIONS for SCHOOL pre-kindergarten curriculum helps children advance skills in core pre-academic areas such as literacy, math, and science, as well as in other essential areas such as art, social and emotional well-being, and health and wellness. Additionally, we introduce the latest teaching technologies including SMARTBOARD interactive whiteboards to allow our children to grow into tomorrow’s finest Kindergarten students. Our child-centered approach ensures that children are exposed to a diverse array of learning activities and that they thrive in all areas of child development, creative thinking, complex problem solving, empathetic collaboration, curious investigation, and astute decision making. All of this ensures that our kids are more than KINDERGARTEN READY upon graduation. The classrooms includes various activity centers which are full of ways for kids to explore and investigate, build, and problem solve. Our Curriculum includes Reading, Art, Dramatic Play, Sensory, Dress Up areas and more. Children are encouraged to problem solve, think cognitively as well as symbolically through match concepts and logistics. Blocks and other mathematical manipulatives promote planning and problem solving. At this age, children are very curious and eager to discover and master new levels. We believe that how children learn is as important as what they learn. Art projects promote creativity and self-expression while music instructs our preschoolers in learning musical concepts through songs, games, hymns, rhythm, instruments and group ensembles. Dance and movement promote physical fitness and coordination. 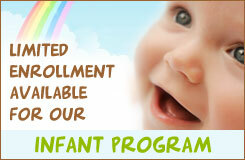 Literacy, Mathematics, Language Arts and self-expression are encouraged at this age. Children have opportunities to help make sense of their experiences and develop an understanding as to who they are while learning to care about others as they adventure into socio-dramatic play. Each month, teachers choose activities based on the unique needs and interests of the children in their class. Children are encouraged to let their creative juices flow as they engage in hands on activities that allow for imagination and questioning. Teacher’s support these self-directed experiences with small and large group activities that give children the tools they need to grow and develop into the leaders of tomorrow. Language library and literature. Reading galore.